Trust Administration differs from a Probate. 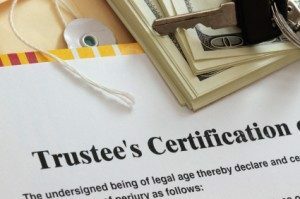 In a California Probate, it is the Personal Representative who administers the Estate whereas in a Trust Administration, it is the Trustee’s responsibility. The basic duties of a Trustee involve the collection, management, investment, and distribution of trust assets. It is also important to keep detailed records as well as prepare an accounting, an inventory, and possibly obtain appraisals. The principal source of Trustee powers and duties is the trust agreement itself, so it is important for the Trustee to be familiar with the terms of the trust. Another important set of duties relates to tax matters. Often times it is necessary to prepare a federal estate tax return (706), an income tax return (1041), and possibly a fiduciary tax return. If someone exceeds their Trustee powers, they may be held liable for loss or damages to the trust Estate. A Trustee must carry out all Trustee activities personally; however, it is recommended that they hire attorneys, accountants, investment advisors, and others to consult with concerning the administration of the trust. Such advisors are usually paid through the assets of the trust, so there is normally no out of pocket costs to the Trustee. Our law firm will work with the Trustee and beneficiaries to have the trust administered in a timely and professional manner. We can offer peace of mind to the Trustee by making sure the terms of the trust agreement have been satisfied. If you have been appointed as a Successor Trustee or are currently acting as a Trustee, contact Hedtke Law Office today so that we can assist you in fulfilling your fiduciary duties.